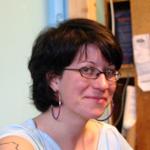 Robin Hewlett is an artist/organizer, whose work creates spaces for exchange and collective learning. She is currently in residence at the Gary Comer Youth Center in Chicago’s South Side. In 2006, Robin was artist-in-residence at Baan Unrak School in Sangklaburi, Thailand. While in residence, she initiated the Write to Fight Book Project in collaboration with the Women and Child Rights Project of Burma. Also in 2006, Robin participated in the Khoj International Artist Workshop in Calcutta, India. She has presented work at the International Center, Chiang Mai, Thailand; Transformer Gallery, Washington DC; and the Mattress Factory, Pittsburgh, PA.